Mark your calendars! We’ll start off with a family-friendly celebration at the East Lynn Farmers’ Market at East Lynn Park on Thursday, September 21st from 4-6pm. Stay tuned for more fun filled details! Cake cutting and formal remarks will begin at 5pm. Then on Saturday, September 23rd, 7-9pm we’re having a cocktail ? soirée at The Shore Leave (1775A Danforth Avenue) with delicious free munchies, both sweet and savoury, as well a cash bar. Be sure to take part in our self-led neighbourhood scavenger hunt!!! Discover 10 unique places in our community – just follow the clues and match each one to a place shown on the illustrated map created by local artist Tak Bui. Download a free Scavenger Hunt Map here, or pick a copy up at the East Lynn Park Farmers’ Market. Once your map is completed, you can enter to win a prize – just drop off your entry at the Farmers’ Market every Thursday from 3-7pm until September 21st. The draw will take place at The Shore Leave cocktail soirée on September 23rd. 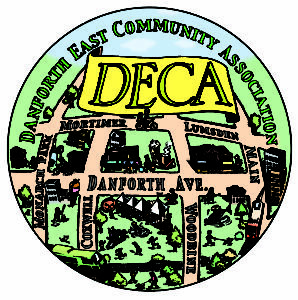 Read more about DECA’s work here. Insipred? Become a member or friend of DECA.